Mike Glicksohn, an iconic figure at conventions with his flowing beard and Australian bush hat, passed away on March 18 after suffering a stroke, reports Robert Sawyer. This came at the end of a years-long struggle with cancer. Mike was 64. He is survived by Susan Manchester, his wife of almost 18 years. From where I was viewing things at the time as a relatively new fan, Mike was already a legend himself — yet he’d only been in fandom four years longer than me. Mike attended his first Worldcon in 1966, Tricon in Cleveland, after learning about it from an ad in Famous Monsters of Filmland. He also co-founded the Ontario Science Fiction Club (OSFiC) that year. He came to the next Worldcon with a contingent of Canadian fans, who wore Spock ears as they watched banquet from an overlooking balcony. (Spock ears were still cool in 1967.) These fans formed the core of the winning 1973 Worldcon bid. Back home in Toronto Mike made his living as a high school mathematics teacher. He and Susan Wood had married in 1970 after meeting at Boskone the year before. Together they published the leading fannish fanzine, Energumen, for several years, turning out 15 impeccably mimeographed issues filled with brilliant art and contributions from the most sought-after fanwriters. Their zine won a Hugo at Torcon II in 1973. However, by that time their marriage had broken up although they remained on terms that allowed them to accept Aussiecon’s invitation to be joint Fan Guests of Honor at the 1975 Worldcon. The Hat Goes Home is Mike’s report of that trip. In the coming years Mike won three Fanzine Activity Achievement Awards (FAAn) as Best LoC Writer. He was nominated for a Hugo as Best Fan Writer in 1977. He was even selected Past President fwa (Fanzine Writers of America) at the 2006 Corflu. Mike reviewed fanzines for my genzine Prehensile in his notorious fanzine-killing column “The Zineophobic Eye.” I don’t say “fanzine-killing” because he indulged in KTF-style reviews. Rather, Mike took a perverse pride in the way every one of the host fanzines had expired soon after his column started running in it. The column had appeared in Richard Labonte’s Hugin & Munin (as “The Zinephobic”), Mike’s own Energumen, and Osfic Quarterly. That’s why Mike began his first installment for me with a warning: “Read this issue of Prehensile carefully friends. Savor it, enjoy it, admire it; it’s very likely one of the last issues you’ll be seeing…” And in that respect my fanzine did not disappoint: his first column appeared in Prehensile 11 and the zine ended its run four issues later. If Mike had a fannish philosophy, I’d say it was something he’d inject into the dialogue when, now and then, things got a little heated: Unless you were having fun, there wasn’t any point in staying in fandom. He was always ready to enjoy the good times and help create them. He’d play along with the joke – like when he let Elst Weinstein and I make him co-GoH of the 1978 Hogu Ranquet. He even refused to let us pay for his hamburger. He was also instrumental in returning the Worldcon to Toronto for the first time in 30 years, co-chairing the Toronto bid for 2003. And because it was Mike Glicksohn who called to invite me as Torcon 3’s fan guest of honor, that meant the world to me. But in January 2011 Mike said his team had recommended a short session of additional chemo as the cancer had not been eliminated. That was the last time I heard from him. Mike will be remembered with tremendous affection. And although forewarned this day was coming his friends still will find it hard to let him go. This entry was posted in In Passing and tagged Mike Glicksohn by Mike Glyer. Bookmark the permalink. Good job, Mike. I did quick, not very personal, write-ups here and here; they’re mild variants. I’ll try to update both with more links as time allows, if possible. On a personal note, Prehensile was one of the earlier fanzines I ever got and enjoyed, and helped lead me into further into the Depths. At risk of getting into exceedingly boring weeds, the Semi-Prozine Hugo creation account you give leaves out about 3/4s of what actually happened. I hate to mention this here, but you’re kind of establishing an official record here, and I’d prefer to not see this distorted. and inserting in Section 10 (Best Fanzine) at the end of the first sentence “whose highest. circulation for the year is under 1000” and striking the second sentence. It’s vastly more interesting to read and write about what a great guy Mike was, but I’ve already done a bit of that, and your comments aren’t really the place for me to do more, so I look forward to reading more from others, and linking to them. Thanks again for your personal write-up, from one Hugo-winning BNF Mike G of my youth about another. It’s just horribly sad to keep watching old friends and acquaintances die, and Mike wasn’t at all that old. 64 is far far far too young. It’s terrible, and writing an obit for Mike wasn’t how I preferred to spend my afternoon, and I’m entirely sure it wasn’t how you wanted to spend yours, either. None of us can be happy about any of this, and the one great tribute to Mike is how many wonderful things are being written about him all over the internet, so many memories shared, on blogs, Facebook, LiveJournal, sff.net, the mailing lists, I’m sure, and on and on. And we’ll have so many stories of Mike to tell in future, and best of all, his zines are online, and physical copies still exist, as well as all those thousands of locs, so the immortality of one’s writing lives on. Small comfort, but it’s something to be cherished, and the wonderful part of being part of any writing community. Ditto that stories of Mike as a con fan will be told so long as the rest of us who knew him are still around to tell them. Like you, I’ve known Mike for 40 years, and I shall miss him and his presence in fandom. Your tribute to him was very good and right on the mark. One more personal note, though (and I see my prior comment is in moderation; presumably the links, and it will appear when you see that): you mention how you only got into fandom four years after Mike, but how long ago that seems, then: the difference between ’66 and 70. I mentioned in my prior comment how Prehensile was among the earlier zines I first started reading circa 1971-2 (I’m fairly sure I locced you, though I haven’t seen those issues in decades — hey, put them up at efanzines, please? ), but I know that I first met Mike at the Aussiecon party at Discon II, in 1974, when I had been reading and loccing fanzines for a couple of years, but had just missed going to Torcon II, the year before, because I was still young and neoish enough to wave goodbye, literally, to a car full of NYC fans driving off to it, without realizing, as I subsequently did, that I could have have squeezed in, and, in those days, found crash space, eaten cheap food, and not missed that wonderful Torcon I heard so much about, while I was still 14 years old. In 1974 I was still neoish enough as a con fan, and all around, to be awed to be among my fannish elders, and it was still a couple of months before I started reading slush for Lou Stathis (unbeknown to Ted White, I think, until later), and was even more awed to be a Galactic Observer, very quietly leaning against the walls of that Aussiecon party, listening and watching as Mike Glicksohn, and Robin Johnson, and Leigh Edmonds, and Susan Wood, and Valma Brown, and Joe Haldeman, and so many others, conversed, played cards, told stories, and I just soaked it all in, learning what The BNFs Were Like. I’ve already mentioned how amazing Energumen was, and I simply can’t begin to do justice to the zines, or Mike in general, but: I just wanted to say something more personal. I hope everyone goes and rereads as much of Energumen as they can, and am sad only that everyone can’t have the physical zines, because truly that was one of many zines where the beauty of the artifact can never truly be recreated virtually. The remain among the greatest fanzines ever done, as I wrote in my too-brief posts. Mike, thank you so much for your brilliant, heartwarming obituary and tribute. It does Mike Glicksohn honor, and it’s a keen service to fandom at the same time. Sympathy, to you and to all of Mike’s friends and loved ones across fandom. Sometimes you get dealt four aces, sometimes aces and eights. Sorry we had to deal ya out, Mike. Rest well old friend. Mike was one of my formative influences in fandom; between him and George ‘Lan’ Laskowski, it was they who got me into fanzines and the written interaction between fen. Mike made me smile every time we met at a Confusion; he was that kind of person. He, Larry Tucker, and I had a few times when we sat in an out-of-the-way place in the con suite, and I would soak up stories from Back In The Day, while managing to dribble in a crumb or two of story myself. Too many of my fannish heroes are dying; Howard DeVore, Jim Overmyer, and now Mike. I’m glad that I was able to give him and Susan buttons of one of his sayings: IF^3… translation, if fandom isn’t fun, it’s futile. We are still in some shock…Mike lived about ten minutes away from us. We have been in touch with Susan Manchester…Yvonne had the idea of establishing a mathematics scholarship in Mike’s name at the highschool he taught at, Humberside Collegiate Institute. Michael leaves a huge hole in fandom and in our hearts. Known him for 40 years, met him for the first time in ’75 and corresponded with him very regularly starting shortly after that, had him visiting and even crashing with Jackie and I when we lived in SoCal and in Cincinnati, and bummed around with him at numerous conventions. A long-time good friend with me and with so many of us in fandom (probably damned near everyone he met; he had that kind of rare personality). We’ve lost someone who was truly one of a kind, and I believe they broke the mould. I am stunned by his passing despite knowing it had to be imminent. His work and achievements in fanzine fandom were very impressive and are now all that remain besides some irreplaceable memories. I’d trade it all to have him back. What a great guy he was. I have only good memories of Mike and was honored to be considered a friend. My admiration for him as a fan and a faned are exceeded only by my respect for him as a human being. We’re all going to miss him. Mike participated in my first fanzine both with locs and articles. It amazed me that such a BNF would not only take the time to participate but truly went out of his way to give so freely. That was Mike. He was there with a fun presence and a wonderful, witty style. I always appreciated his fine words, both in person and in writing. He was cool to hang out with and always had a smile and a great hug. He’s a part of my fannish history and somehow the world seems like a much dimmer place without him. You will be very much missed Mike. Mike G. I echo the great job on the obituary. Something I just noted in comments on both my posts, along with all the other stuff I added in the last couple of hours: Just saw a tweet from someone sad about Mike’s death because his 11th-grade math teacher had died. There have to be thousands of kids who Mike taught over the years who will remember him that way. I’m not sure how long he taught, exactly, but I’m guessing over twenty years, maybe even thirty, and that must add up to an awful lot of former high school math students. My comments would be rather too long, so I posted them here, http://www.furaffinity.net/journal/2181718/#cid:17731950. Not that Mike was a well known name on FurAffinity, but I update my journal there every week. What else was I supposed to write under the circumstances? Damn. I knew him from the old Ontario Science Fiction Club, he was an icon in his own time. Somehow arguments just didn’t seem to happen when he was there. Maybe I’m not remembering that correctly, (it was a while ago), but that’s how it seemed. I remember he was a pretty good auctioneer, too; he took enough money from me that I couldn’t really afford, but that was my own fault. He was a good guy. Whatever happen after life, may it be gentle to Mike Glicksohn. Both Rick Lieder and I adored Mike. He is and will be always be dreadfully missed. I didn’t cross paths with Mike Glicksohn very often, but the times we did always resulted in good conversations. He was the presenter for the 2003 Best Fanzine Hugo Award, and receiving the award from him meant a lot to Nicki and me. We are all diminished by his passing. So sad to see another great fan go. I met Mike at the ’69 Worldcon when he brought me a glass of ice water as I was close to fainting from the heat. That remains a vivid memory despite many good times that came after. Mike was the first person I saw at my very first convention in 1973: Hatted, bearded and wearing a large boa constrictor. I almost turned around and left. A few months later I actually met him. That time he was wearing nothing but a towel around his waist and a paper bag over his head. Though short in stature, Mike was definitely one of fandom’s larger-than-life characters. Along with him, an era has passed. Your otherwise fine obsequies omit mention of the many years during which Mike was fandom’s premier letterhack. To my mind, he was the greatest letterhack ever. Harry Warner Jr. might have been more prolific — I’m not sure — but Mike’s locs were always most colorful, and above all, encouraging. For years, even the direst crudzine could count on getting something thoughtful and worth printing from Mike. He was a very fine person and a trufan. I remember Mike so fondly. Always so warm, funny and intelligent, a joy to converse with, and he gave the most wonderful hugs in the world. And I well remember the pure happiness on his face the day he married Susan. The world is a dimmer place without you, Mike! Mike purchased many of my sculptures and gave me lots of artistic encouragement. I will miss you. Mike was a friend for a good number of years. Someone came between us way back when and that was my fault for letting her matter more than a good friendship that might have lasted a lifetime. If you met Mike you know he was always smiling. He was always able to bring you back to ground level when a conversation started to get too hot. Arguments did happen when he was around but they always seemed to be more civilized. I’m glad he got through February. That would have totally sucked for him to have passed in February. And I well remember the pure happiness on his face the day he married Susan. Er, I think he was very happy each time he married a Susan. The second time lasted much longer, but the first lasted quite a while too, and was the better known to fandom, the co-publisher, co-Worldcon GOH, and co-Hugo Winner. I don’t know Hillarie Oxman Mankoff, but I’m guessing he means the currrent Susan, Susan Manchester, as that seems perhaps more likely, and that Ms. Mankoff does not mean Susan Wood Glicksohn — but I’m just guessing. Either way, we all miss him. I’ve updated both my Amygdala post and open Facebook post with more quotes, links, writing, and details. […] so many of Mike’s famous writer friends, and so many well-known folks, would want to help out, that I’m sure something real could be worked out so long as there are people at the school willing to work on it, and someone local who knows what they’re doing who is the same, and similarly handle the legal and administrative angles, which can be, to be sure, time-consuming, involving, ongoing, and something that would be apt to be a commitment of, well, as many years as people are willing to work on making it last. There are ways to start talking endowments, but then you really need to bring in a good tax lawyer, and so on. Raising the money really wouldn’t be the harder part, I think, if you want to go long term, but even as a commitment for a few years, or 5 years, say, it would be a wonderful thing. Meanwhile, Mike’s passing on has been commented on endlessly all over blogs, Facebook, LiveJournal, mailing lists, in endlessly more comment threads that I could list or be aware of or have access to, and I’m sure the same will be true in fanzines, and yet more comments and articles continue to pour in and will do so for years to come. Argh, among other problems, “he” should be “she” (I think), and “insead” s/b “instead,” and there’s the minor formatting error, and I apologize. This is about the 60th update/post;comment to something about Mike I’ve done in the past 24 hours, and I shouldn’t be writing just after waking up, while trying to update four separate posts at once in different tabs, when one place doesn’t have a means of editing. Apologies. Feel free to fix, delete relevant sentences and this comment, Mike. Kathe Koja, I included the video in both my posts; Sandra, I mentioned you several times in both my posts. I met Mike as early as 1972 or 73, and I remember that I didn’t look like he thought I would look, and we laughed about our imagined images of each other. I really liked him, and I really liked his first Susan. I was shocked when I recently Googled him to see how he’s grayed, but on the other hand, I think I’ve grown into the image that he’d first had of me. I’ll miss your voice Mike, and I do miss you. I don’t have much in the way of photos of Mike Glicksohn, it seems. There may be more buried among the old negatives of my first Worldcons, but he isn’t indexed in any of the ones I’ve scanned so far. We were at a number of Wilcons together, but I basically didn’t shoot pictures there. I do however have two from 2007, which I offer in remembrance. There are such things as high school scholarships? Let us suppose so, for the sake of argument. I’d rather see something more fannish, though. Murray Moore is trying to organize a tribute zine, which would be a good start. If it weren’t so many months away, I’d suggest a fannish “wake” at SF Contario. The hell with it… even if the con is in the Fall, I’m suggesting it anyway. The Reno worldcon would be a little sooner though, and would’t *preclude* another at SF Contario. Another thought — name the letter hack FAAn “the Glicksohn” in his honour. The only drawback is that there’s another possible claimant — Harry Warner Jr. Anyway, something along these lines would seem more relevant. I like the idea of the scholarship and will contribute if it gets rolling. That would keep his name alive in a place where he made a difference and will doubtless outlast any tribute we can pay within fandom. Of course we will always remember him, as the comments here and at Amygdala show. Doing something within fandom is not mutually exclusive with a scholarship fund. The FAAn for letterhacks already is nicknamed for Warner, I should point out. John Hertz passed this news on to me…I’m very, very sorry top hear of Mike’s death. He accepted a lot of my fan art for “Energumen,” a beautifully produced fanzine and one I was proud to be a small part of…he will be missed. Mike was my math teacher back in 1974~75 at Humberside but I have fonder memories for the card games (poker) we and a few others occasionally held that carried on into the wee hours of the morning (at times) a few years later. He always encouraged me to follow through with my art ( I was into Surrealism for the most part back then) and I eventually started up professionally in the visual art & entertainment industry in 1986 due in large part to things that Mike had said back then that had stuck in my head. I knew Mike was into the Sci-Fi realm but I didn’t realize to what extent until running into him in the late 1990’s while at an Edo van Belkom book release in Brampton. We only ran into each other a few more times over the next ten years or so and the last time I saw him was when a mutual good friend Nick who was in touch with Mike on a regular basis invited me to join them for lunch (early 2008 or so ?). We had a great time catching up on things and while Mike did mention he had a few health issues he downplayed it. He was always humble and kept things upbeat… that was His way. It was the last time I saw him. Murray Moore has withdrawn his plan for a memorial one-shot in response to the suggestion that there already will be a great deal going on at the service. He will see if his project can be merged into Chris Garcia’s Glicksohn theme issue of The Drink Tank and plans to ask those who already contributed things to him for permission to pass them on to Chrus. Excellent obituary; thank you for it. The picture you used of Mike, by the way, was taken by me on December 15, 2008, at a party in my home in Toronto. Mike’s memorial service was held this evening in Toronto; turnout was large despite a snow storm, and it was an excellent service, with as much laughter as tears. Mike would have been pleased. I was sorry to find out about Mike’s passing, he always seemed like a genuinely nice guy. He was the first BNF to loc my first teenaged attempt at a fanzine, way back in 1973, and I always appreciated his comments. Sad. I’ve sent you a bunch of photos I’ve taken of Mike over the decades; perhaps you might like to post some of them here. I knew Mike since his earliest days in fandom, staying with he and Susan in their Toronto apartment, and working with them on the 73 worldcon bid. Together, we’ve been though quite a lot of fannish and personal history. I will really miss him. @Andrew: Excellent suggestion. Thanks for letting me run them! 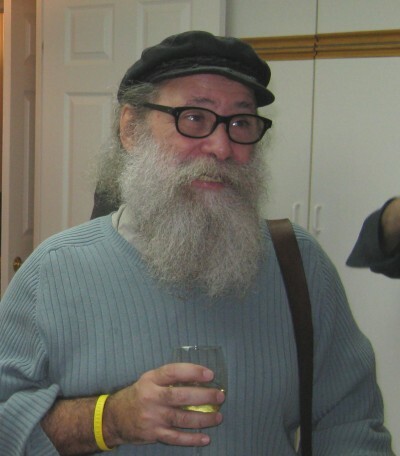 I only just heard of Mike’s passing from an update to the BASFA (Bay Area SF Association) minutes. Coming into Toronto fandom in 1976, I found myself in the position of being expected to Chair SummerCon, what was planned as a small (~100 person) convention. Mike was very helpful to a neo con runner and I learned much of what I knew about running good conventions from him and Gordie Dickson. His house was full of great pieces of fannish and SF artwork. He never boasted about it or the friends he had (who were the top artists, writers, editors and fans of the day) … they were just friends he hung out with. This even-keel, come-join-the-party approach to fandom, and life in general, was inexorably entwined with his character. As a High School math teacher, a fanzine writer and publisher, as a convention organizer and mentor, Mike could always be counted on for a straight answer, a kind word, a clear point of view and/or a good laugh – often in combinations. At one point I managed to pick up a large stash of old fanzines (from Joanne McBride??) and in it were copies of Energumen, a zine I’d only heard of. I still remember reading through them in sequence, admiring the prose, marveling at the impeccable mimeography, enjoying the essence of what fanzines could become. They inspired me to do better, try new ideas, add new colour and improve the flow of my own zines. Imitation as flattery. I last spoke with Mike at the Winnipeg WorldCon, and as usual we just picked up our conversations and kept going. Mike was always gracious, always at ease and always put others at ease. He had a talent for relating to people, listening to their stories and sharing his own without the competitive oneupmanship that can sometimes creep in. Both Mikes shook their heads and said “You won’t finish it.” When it came, I took a small sip to see what I’d gotten into. It’s taste was … ah … “unique” shall we say. Amid the laughter I just let out a sigh. I said something like, “That is … different,” which garnered a few more giggles and then we all went back to our conversations. When we got up to go a fair while later Mike put a hand on my shoulder and gave it a squeeze. “Well done,” he said. I think he was the only other person there who noticed I had actually finished the glass – I hadn’t made a fuss about it. I’m proud to say Mike was a friend and mentor. While I’ve dropped out of fandom and find myself caught in the rat-race of Silicon Valley, memories of adventures, anecdotes, cons and conversations with Mike will always be a part of me. I will miss him.